I am not much of a writer, but from time to time I feel that it is important to have a place to communicate important pieces of information that can be used for current and future reference. Initially, one of the most important points that I need to communicate to my new clients is that .... yes..... these little plants will grow into a full landscape. It can be difficult for a "first timer" to understand this, especially because landscaping often follows home improvements such as room modifications and additions which provide immediate gratification. Landscapes on the other hand, take a little time to provide full satisfaction. 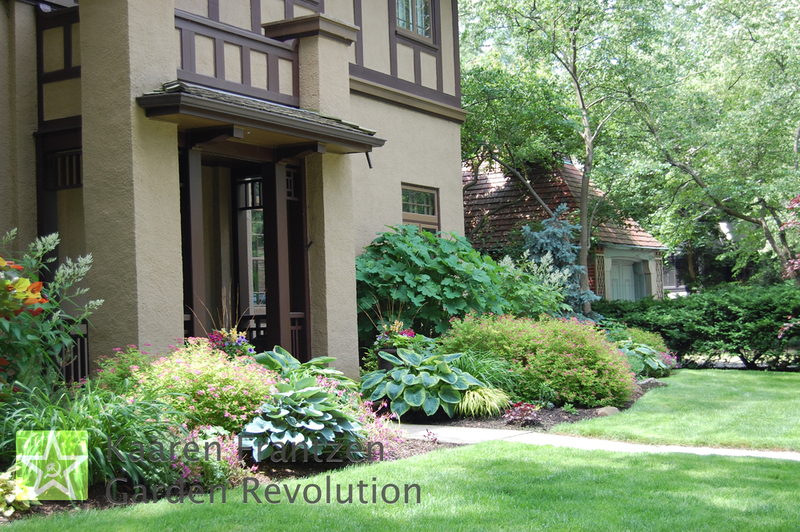 Luckily, there is often some form of immediate gratification as the mere removal of the ugly old scraggly or dated shrubs perennials and trees that surround many homes like a "too tight" belt, can be a relief to the senses in itself. The good news is that younger plants are less expensive than more mature transplants, and that landscapes planted with young plants will establish more quickly than transplanting more mature and larger plants. They grow faster and healthier, and within three years will often grow larger and fuller than their more mature cousins, as it is more difficult for mature plants to acclimate to the new location. Therefore patience is a virtue when caring for a newly landscaped yard. The best thing that you, the client, can do for your newly planted landscape is to care for it appropriately. During the first year that means providing adequate water, and care in the form of weed removal and pruning. For the client that doesn't like to weed or prune, I recommend having a professional to provide care every couple of months to monthly during the growing season. This includes spring and fall cleanups. This may seem like a lot, but the rewards will be great as most weeds are highly aggressive and are not only unsightly, but compete with the ornamental plants for moisture, nutrients and even for space. Since during the preparation process, the installers will work the soil, augment the soil with nutrients, and lay down mulch, fertilization and mulching should not be an issue for the first year, yet is important. I will talk about the intricacies of plant watering and fertilization and mulching in future posts dedicated to just those topics. As for winter care, I'm not one to use plants that have to be "all wrapped up" during the winter. I consider winter to be an aesthetic season, and want to keep things pretty. After the first year, for the first few years at least, I recommend adding additional mulch to the exposed garden beds to about three inches thick. This helps keep the annual weeds from germinating, helps retain moisture and keeps the soil temperature from rapid fluctuations which can cause heaving of roots. For now, just be aware the more care that you put into your infant garden, the more rewarding it will be for you in the future. Here's to dreaming of Spring!